There is a lot to consider when it comes to finding the right dog to join your family. Scout has put together this post to help you make the choice that is right for you and for the dogs you are considering. It is important to remember that your decision to adopt or purchase a dog is a big choice that can not only affect your life but also the entire future of the dog. If you make the wrong choice and the dog has to go to another home, it can be devastating to all. While Scout knows that sometimes things happen, there are things you can do to increase the odds of a great match for the life of the dog! While it is great if you can adopt a shelter dog, this is not always the best choice for you or the dog in question. The availability of shelter and rescue dogs can vary a lot based on where you live. When I lived in Ketchikan, Alaska, for example, there was a waitlist for shelter dogs to adopt. There simply wasn’t the population of dogs or unplanned litters that occurred in other places. As a result, we bought a purebred dog because that was the option we had if we wanted a dog at all! Spay and neuter programs have been wonderfully effective in preventing the occurrence of dogs finding there way into shelters. The area of North Carolina where I live now had a lot of unwanted litters when I was a teenager but now there are very few dogs in shelters. The problem is that a lot of those in shelters and up for adoption are controversial breeds or senior dogs which are not appropriate for every household. Some breeds need a lot of activity and that is not something that every person can give. Sometimes they come from homes where they have been neglected or abused and are traumatized so they need a forever home that includes someone that has the time and patience needed to help them overcome these challenges. Someone adopting one of these breeds and then keeping them in a low activity environment would not be good for them or the dog. Being a dog parent is not something to take lightly. Consider your age and where you are in life. For example, my father-in-law bought what is considered a designer dog. Tucker is a beautiful Golden Doodle. Since my father-in-law is in his seventies, he was trying to think about what type of dog would be manageable for him and also about how this might be the last dog he got as a puppy considering his age. He wanted a specific dog. Despite having adopted mix breeds over the years, they really wanted to make sure they got a dog that would be a good size but would not shed so much that it added to extra household chores. Unfortunately, there are some people that do not understand why someone would not adopt a shelter dog every single time. He has been lectured numerous times and had to explain why he chose to buy a dog and not adopt. The adoption options in my father-in-law’s area were limited and did not suit his needs. When you bring a dog into your family you are responsible for their health and well-being. It is always heartwarming to hear the stories about senior dogs and those with special needs finding a forever home. It is a wonderful thing to do if you have the resources and time. Caring for a special needs dog will likely require some financial resources that a younger dog does not. There is also the considerations that you have to make in activities that you include them in. If you have kids that really want a dog that can romp and play and go on hikes then a senior dog may not be the best fit for a primary dog in your home. As a second dog they may work out fabulously but you will need to educate young kids on the limitations and treatment required to keep an older or special needs dog healthy and happy for the long term. 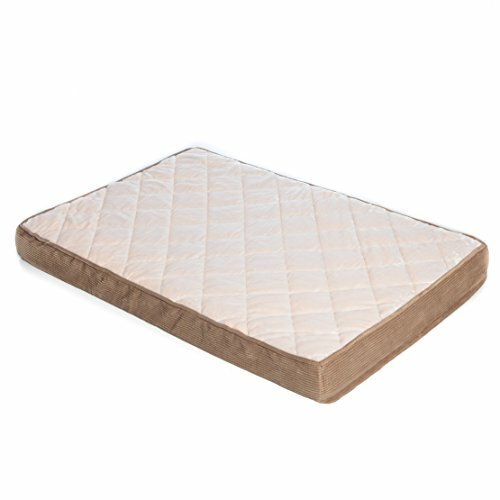 An orthopedic dog bed can help older dogs or those with special needs but any dog will appreciate a comfortable and nice spot that is all their own! This affordable choice has a washable cover so keeping things clean is a snap! Some dogs need more activity and like to make more noise than others. As someone that has owned hound dogs and Chihuahuas, and currently has Great Pyrenees, I know all about dog energy and noise! If you live in a neighborhood where houses are close together or in an apartment or townhouse then you need to carefully consider the likely habits your dog will have. Some people are better at training dogs to be quieter than others. Training takes a lot of consistency and time. I would not recommend someone in a neighborhood with neighbors ten-feet away to get a Treeing Walker Coonhound or a Great Pyrenees. Lots of people are able to manage these breeds in a small neighborhood, but it is not an easy go. If you work outside the home and the dog is often left alone, then you might have a very hard time getting them to not bark too much when you are away. 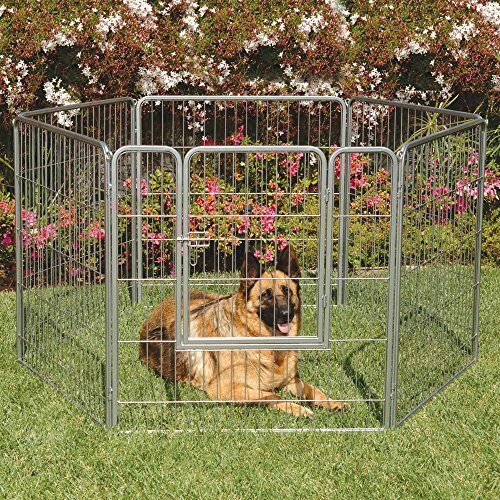 Pet kennels and play areas can help allow your dog some freedom. Smaller dogs in a large pen can have substantial room to play and run so they can utilize some of that excess energy! This large pen is affordable and allows for a lot of room. For a larger dog, this size kennel or larger works best. You can add a cover or dog house for shelter if you want them to be allowed outside during various weather conditions. Shade is important in the summer so a cover or putting this pen in a shaded area is recommended during those hot months. If your local shelter or rescue does not have a dog that is right for your situation then you may consider looking at shelters in neighboring areas. Alternatively, check out Craigslist for mixed puppies or affordable ones. While some warn against getting a dog from Craigslist, there are plenty of people on there that mean well and only want a small fee to cover the dog’s expenses just like a shelter does. It is possible to have dogs shipped, but it is often cost prohibitive to do so and you need to be careful how it is done. Check out Scout’s post on airline travel for more info on rules and costs. There are so many different types of dogs and people out there in the world. There is a lot of beauty to that when you think about it. Matching up the right dog can mean narrowing down choices based on specific traits. I live on 11 acres with sheep, cats, geese, and a vineyard that needs protection from predators. Out in the country we have to keep coyotes, bears, deer, raccoons, opossums and more at bay or risk losing livestock and crops to predation. We choose to have Great Pyrenees to patrol the property and keep predators away. Although before the property was fenced we had some incidents where they actually had confrontations with coyotes, now they are in an entirely fenced property and we do not have to worry about predation nearly as much. The fence is one barrier but if a deer jumps it and gets in the grapes the dogs can chase them off. Aerial predators like Great Horned Owls could easily carry off a toy breed. As you can see our situation is a bit different. Another example is the elderly who need a small dog that is manageable for them. In this case, they may find that they need to buy a purebred small breed in order to have a dog that can be happy with them and easy for them to care for in general. Scout knows this post might have caused you to think a lot about becoming a dog parent. Keep in mind that considering the long-term future and comfort of your dog– and your ability to provide that for them– is one of the most important steps in making this decision. You will make a great dog parent and make the right choice for you and your future member of the family!